Ubisoft is the name behind a ton of great games all around, and the team has always been very bold in terms of the overall promotion of their games. While the studio is still riding high on the success of Assassin’s Creed Origins, it is all set for the release of their highly anticipated upcoming game, Far Cry 5. And to create further excitement amongst the players, Ubisoft has also announced a special limited edition of the game. If you’re a fan of having a collection of vinyl game soundtracks, the Far Cry 5 Limited Edition is a one to look out for. Mondo, the company that has previously produced the Contra vinyl and The Last of Us box set, has now partnered with Ubisoft for its upcoming game. 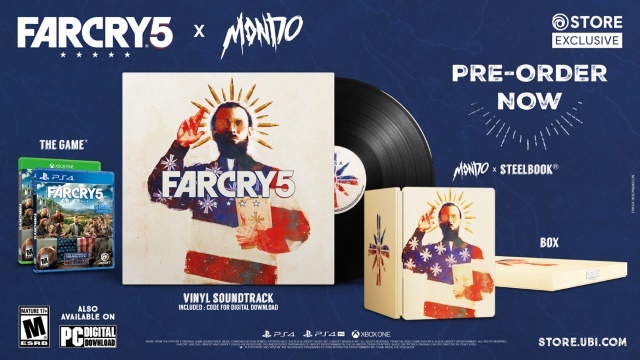 Ubisoft, in partnership with Mondo, has unveiled the “Far Cry 5 x Mondo Edition” of the game. According to Engadget, the limited edition comes with the main Far Cry 5 title packed inside a beautiful and durable SteelBook case which has been designed by the creative director of Mondo, Jay Shaw. It also has a vinyl record with the original Far Cry 5 soundtrack on it, and a nice little box to hold it all in with an illustration of the game’s main villain Joseph Seed. Oh, and don’t worry, you also get a download code to download the original soundtrack digitally to your devices. Also, as is the case with every special or limited edition of a game, you’ll also receive special in-game cosmetic and consumable items in the Doomsday Prepper Pack and Chaos Pack as part of your pre-order. The Far Cry 5 x Mondo Edition is priced at $100 and can be pre-ordered right now via Ubisoft’s Store. Considering that there will only be 4,000 of these units available worldwide, you might wanna reserve your copy as soon as possible.